Thanks to a bunch of fun-spirited AWESOME people our pre Halloween SUP parade a great success!! 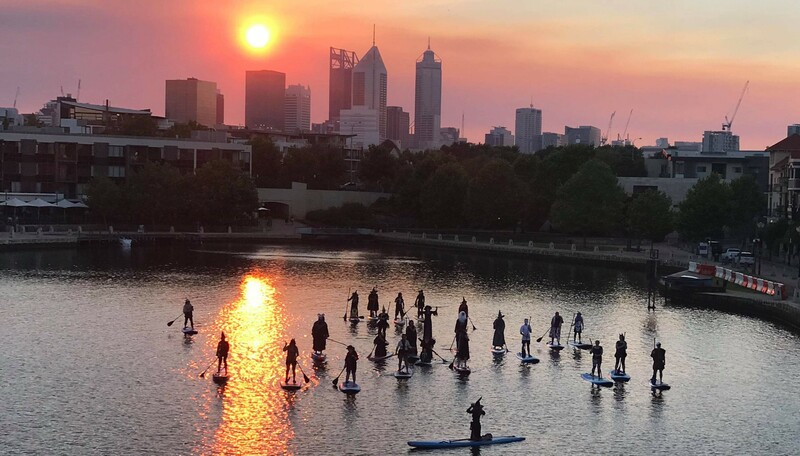 On Saturday the 27th October almost 30 witches, wizards and creepy creatures paddled from Bardon Park, Maylands into Claisebrook Cove, East Perth. Unsuspecting residents, passersby and patrons were enjoying their supper and drinks at the local cafe’s and bars…until we came along!!! Capes were billowing, hats and horns were flapping as we ploughed into a strong headwind however lucky for us the wind soon dropped and our coven stormed into the Cove creating a buzz of laughter and joy! It wasn’t long before the antics began as the witches and wizards put on a great show demonstrating a few tricks and treats! As the sun set we retreated leaving behind fun memories for our on lookers and an experience for us to giggle about until we do it all again next year! Everyone went to great lengths with their fantastic costumes creating an awesome vibe for the event and I must say a big thanks to Ian and Annie from Annies Woodfired Pizza for their hospitality and providing yummy pizza’s for the ravenous paddlers. Thank you Tina and Mark Nunnington from Perth Aerial Imagery who unknown to me at the time took amazing pictures and drone footage of our event. Check out the links to the pics and video footage that captures our fabulous parade. Also a big shout out to Paul Goodwin, Kevin Bassford and Tim Mulford for being our guardians on the water and to Mike & Michelle Lenane from Sunset SUP for joining us on the dark side!! Our next event will be the annual “Orphans Xmas” on Christmas Day with details still to be confirmed. Of course there will be a mandatory fancy dress theme…it’s just how we roll at SUP Tonic. Happy paddling and see ya’ll on the water somewhere soon!